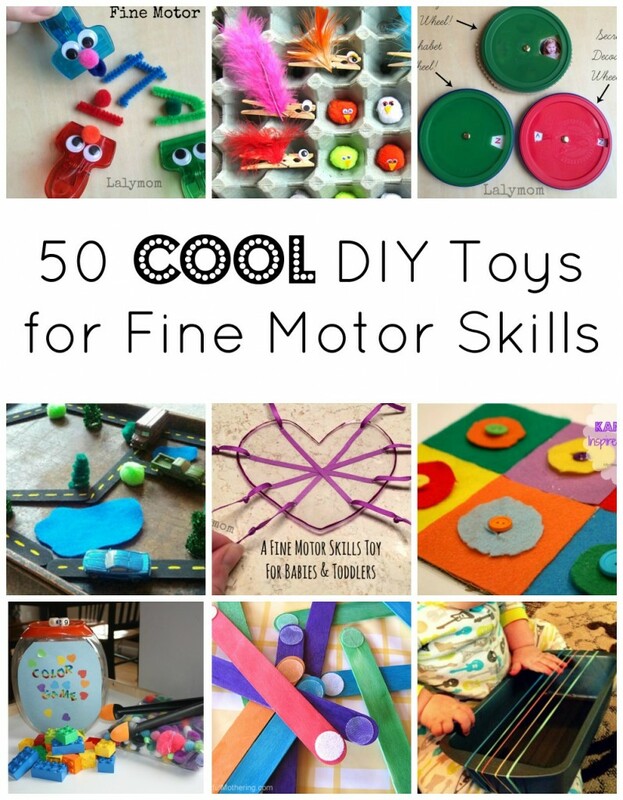 Today I am sharing 50 Must-Make, Super Cool DIY Fine Motor Skills Toys. Affiliate links are used in this post. 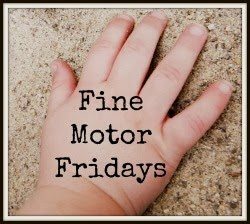 Below is a list of 50 Cool fine motor activities from Lalymom, my fellow FMF bloggers and others around the web. You will find toys made using recyclables, household items and craft supplies. Each one can be made with your own spin, customizing colors, shapes and more to fit you child's personality! You'll find toys that encourage pushing, pulling, twisting, turning, poking, cutting, dropping, clipping, pinching, tying, stacking, buttoning and even flicking. Phew- So much fun packed into this post. And every single idea just begs to be played with in a way that is sure to get those hands, fingers and thumbs moving. Am I missing something that you made? I would love to hear about it! Please leave a comment below to tell me about it or hop on over to my Facebook page to share a picture! And don’t forget to stick around at the bottom of the post to see what the other FMF bloggers contributed this week!! Please do CLICK on your favorites to see the WHOLE post and any instructions! 3. Fine Motor Dashboard- BLAST OFF!!! 6. Homemade Baby Guitar- Easy and Fun! 7. Kandinsky Inspired Button Board- So Colorful! 8. Easy Lid Wheels- Decoder, Alphabet & Faces! 9. DIY Magnetic Roads Playset- VROOM VROOM! Fun! 11. Velcro Dot Craft Sticks- Simple & Open Ended! 12. Upcycled Wall-Mounted Dashboard- So Cool! 15. Button Worm & Apples Playset- So Clever! 17. Homemade Light Box Manipulatives- COOL! 18. DIY Puzzle in a Box- Take It With You! 19. Fabric Covered Block Puzzle- Customized! 22. Themed Threading Activity- Do Each Holiday! 25. Coffee Can Twisting Puzzle- What a Cool Idea! 26. 5 Little Ducks Finger Puppets- Genius! 30. Toilet Roll Empathy Dolls- SO Cool! 36. DIY Sticky Velcro Blocks- So Awesome! 37. DIY Felt Button Chain- Click Through to See! 38. Family Faces Mega Blocks- SO Fun!! 39. Show Tying Board & Tips to Help Learn! 40. Clothes Fastenings Board- Life Skills Bonus! 41. Giant Lacing Spider Web- AWESOME Idea!! 42. Natural Loom- Beautiful and Unique! 49. Two Ingredient Ribbon Pull- Easy & Fun! 50. Finger Hockey Ice Rink! As has been the case every Friday for months now, we are joining up with a team of bloggers to bring you a collection of Fine Motor Skills ideas! Please click through to see all the other great ideas from this week and be sure to follow our Pinterest board below as well! cool list! Lots of fun DIY toys! Thanks for including a couple of ours! This is an AMAZING list!! Thank you for the kind words, you are welcome, I love that twist puzzle, so very cool and original! Glad I saw your post!! Very cool! Love that you created a linky list; they all look so fun! Great list! My girl will be very happy to find many new recycling projects here. They love creating new toys out of old stuff. Thanks for sharing!